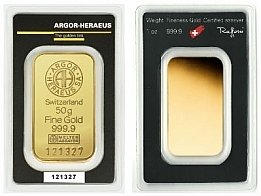 Argor Heraeus 5 Gram Gold Bullion Bar 999.9 Fine. Each bar comes individually sealed in its own certicard to help prevent damage to the bar. At the top of the bar is the Argo Heraeus logo, followed by the weight, fineness and serial number of the bar. The bar's serial number is also located on the certicard. 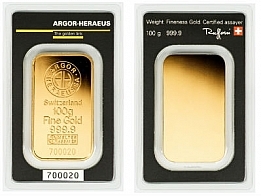 The Argor Heraeus gold bar series is available in gold, silver, platinum and palladium to bullion investors. 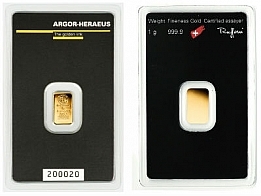 Argor Heraeus also produce a multigram bar, which is also available in gold, silver, platinum and palladium. The Argor Heraeus Kinebar series is only availble in gold. 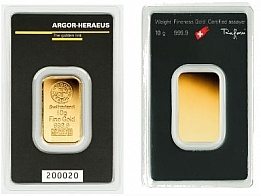 Argor Heraeus gold bars are available to individuals looking to buy gold bars in sizes ranging from 1 gram to 1 kilogram. Bars may include Austrian Mint or Kantonal Bank markings.